Dr. Mandy Abushama is a Royal College of Obstetricians Fellow and is a UK-trained gynecologist and general practitioner. After working for many years in the UK, she moved with her family to Qatar in 2002 where she was a consultant obstetrician and gynecologist at Hamad. She joined Weill Cornell Medical School as an Assistant Professor in 2005 and continues teaching students at the Feto Maternal Centre which is an Affiliate practice to the University. 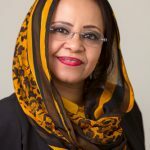 Dr. Abushama established The Feto Maternal Medical Centre, and is currently the manager whilst continuing her clinical role seeing both obstetric and gynecological patients. She is an expert in obstetrics and gynecological ultrasound, and extensively uses the high quality General Electric Volluson models, of which the centre has six, ranging from the lightweight to the top of the range E10 model which she uses for antenatal screening. Her main areas of interest are family planning, menopause and women’s health, and she believes screening is very important. Academically she is widely published. For over 10 years, she has been involved with the Ian Donald School of Medical Ultrasound; she is their National Director here in Doha, Qatar.